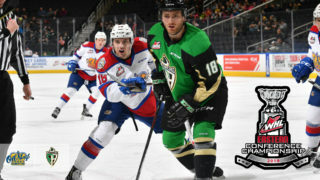 Josh Williams scored the first ever playoff goal at Rogers Place, but it was the only time the Edmonton Oil Kings (0-1) managed to get on the board, falling to the Medicine Hat Tigers (1-0), 2-1, in Game 1 of their best-of-seven Eastern Conference Quarter-Final playoff series in front of 6,391 fans on Saturday night. 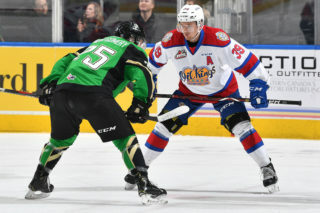 The Oil Kings stormed out of the gate and outshot the Tigers 6-0 to start the game, and were up by a 13-9 margin by the end of the first period. Edmonton had peppered 36 shots on goal by the end of the middle stanza, but were met with a dominant goaltending performance from Mads Sogaard (1-0). 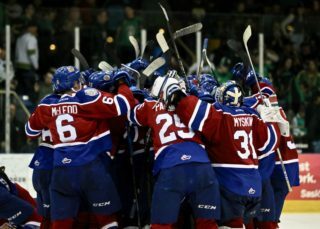 The Danish goaltender for the Tigers was named the game’s First Star, making 49 saves on 50 total Oil Kings shots. 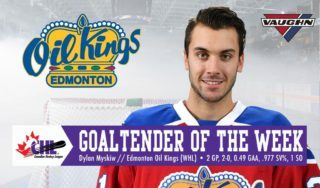 Dylan Myskiw (0-1) also had a valiant night between the pipes for Edmonton despite the loss, making a number of high-end, quality stops to prevent the Tigers from growing their lead. The first period of play was scoreless, with Edmonton outshooting Medicine Hat by a margin of 13-9. 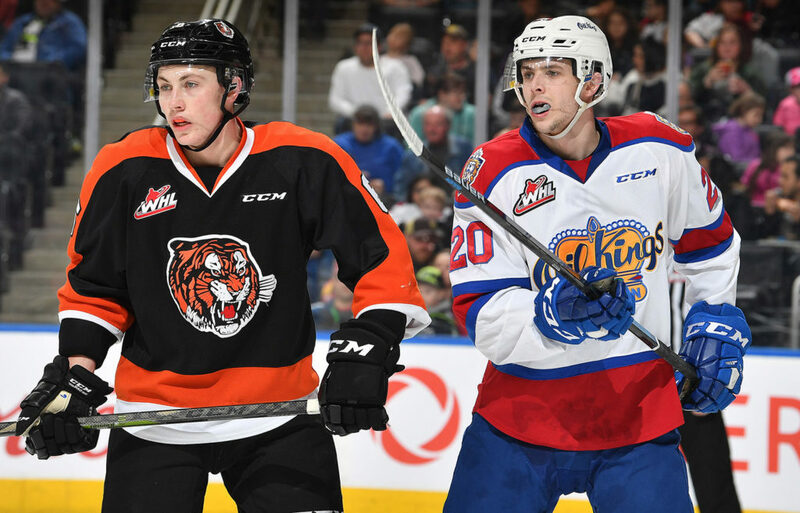 The Oil Kings took control of the shot clock in the middle frame, but it was the Tigers who took control of the scoresheet with a pair of hard luck opportunities from Edmonton’s perspective. With Edmonton on the power play after a tripping call to the visitors, it was Medicine Hat who capitalized – shorthanded – to open the game’s scoring at 4:18. 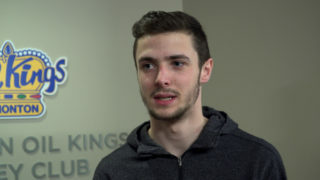 Following the goal the Tigers took another two-minute minor, giving the Oil Kings a 5-on-3 man advantage for 19 seconds, but they would fail to convert on the opportunity. In the second half of the period the Tigers made it 2-0 – and to add insult to injury, during the Popeye’s Chicken Minute – at 13:20 which rounded out scoring in the middle stanza. Shots on goal were 23-13 in the second, and 36-22 Edmonton after 40. In the third, with time winding down and the Tigers maintaining a 2-0 lead, head coach Brad Lauer elected to pull Myskiw in favour of an extra attacker, and it went exactly according to plan. Williams got on the board against his former team cutting the Tigers lead in half to 2-1, from Matthew Robertson and Ethan Cap, at 17:58. 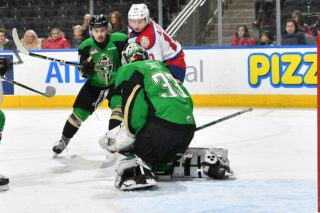 The Oil Kings had another prime opportunity to tie things up just 30 seconds later as Medicine Hat was whistled for a delay of game penalty after clearing the puck over the glass in their defensive zone. Edmonton decided to send Myskiw back to the bench for a two-man advantage, but the final buzzer would sound before they were able to pot the equalizer. Medicine Hat was 0-for-1 on the power play, while Edmonton finished the game going 0-for-3 with the man advantage. James Hamblin (MH) (3), Dylan Myskiw (EDM) (2), and Mads Sogaard (MH) (1) were selected as Three Stars of the Game. Tickets to Game 2 tomorrow, Sunday, March 24 at 6:00 PM MT at Rogers Place are on sale now and available online here.